Daily Login Rewards add-on will add the “Rewards Calendar” submenu under the GamiPress menu. Accessing to this menu you will be able to start configuring rewards calendars similar to WordPress post/pages views. 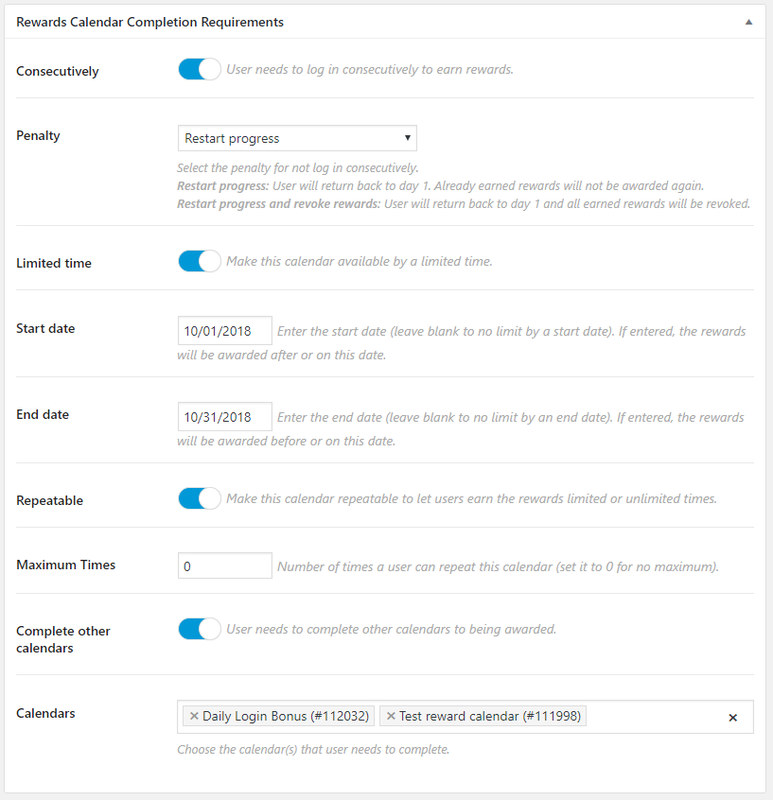 First you can set any limitation as you want like force consecutive log ins with penalties, limit the calendar by a time period or require to complete other calendars to being started with the current one. Checking this option will force to the user to need to log in consecutively to earn rewards. If user doesn’t logs in consecutively, the configured penalty will be applied. Restart progress: User will return back to day 1. Already earned rewards will not be awarded again. 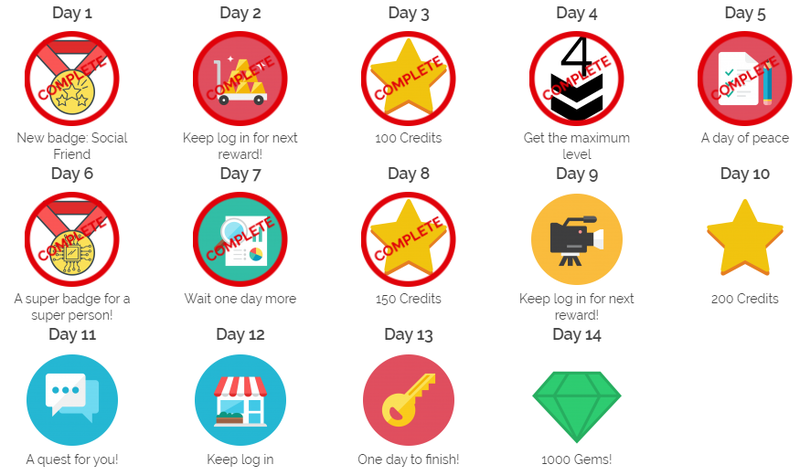 Restart progress and revoke rewards: User will return back to day 1 and all earned rewards will be revoked. Checking this option will make this calendar available by a limited time. The start date (leave blank to no limit by a start date). If entered, the rewards will be awarded after or on this date. The end date (leave blank to no limit by an end date). If entered, the rewards will be awarded before or on this date. Checking this option will make this calendar repeatable to let users earn the rewards limited or unlimited times. Number of times a user can repeat this calendar (set it to 0 for no maximum). Checking this option will force to the user to complete other calendars to being awarded. The calendar(s) that user needs to complete. to being awarded. 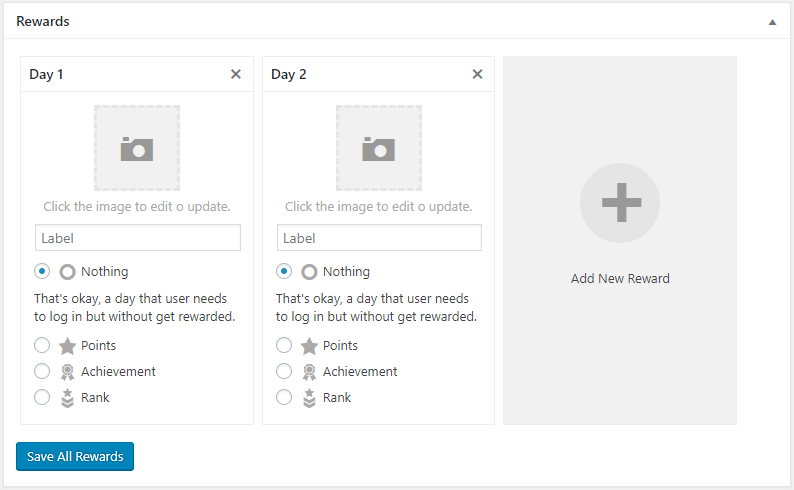 From the Rewards Calendar Display Options box you will be able to set which columns will be showed to the visitors and enable/disable the frontend live functionalities. When user gets rewarded, show a pop-up to notify it. Note: Check this page to meet how the pop-up works. Columns to divide calendar rewards (you can override this option in [gamipress_rewards_calendar] shortcode and in GamiPress: Rewards Calendar widget). Size of the rewards images (you can override this option in [gamipress_rewards_calendar] shortcode and in GamiPress: Rewards Calendar widget). From the Rewards box you will be able to configure the rewards that will be awarded for completing the calendar. The way to configure them is really easy and you will get familiarized with it quickly. You can check this guide that will help you to configure them. From the Daily Login Rewards settings page you can enable/disable the ability to access to a rewards calendar as a page. 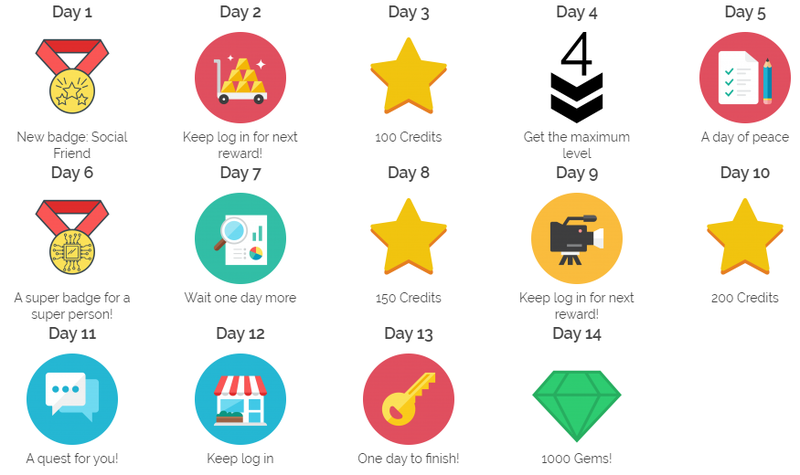 If you disable it, Daily Login Rewards has the [gamipress_rewards_calendar] shortcode that allows you to place a rewards calendar anywhere, including in-line on any page or post. Also you can place any rewards calendar on any sidebar through the GamiPress: Rewards Calendar widget.